The Kid's gonna find a whole new handheld audience - unless they only have iPhones. Come on and listen to my story. This one's nothing fancy, but it's got to be told just the same. I remember the old days; hell, I remember a lot about them. 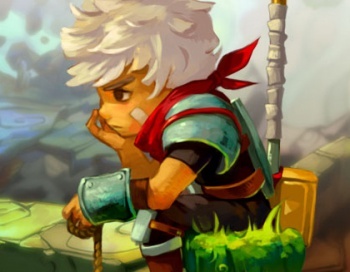 Doesn't seem like so long ago that Supergiant games released Bastion for Xbox 360 and Steam, but that still leaves an awful lot of folks who can't play it. Well, if they've got iPads, they're covered now: Supergiant is releasing the Kid's adventure for Apple's second- and third-generation tablets tomorrow. And I thought we'd been through enough already. But every story's got to start at the beginning, even if figuring out when that is ain't so easy sometimes. 2011's indie darling action/RPG is intact - well, as much as anything is intact these days - after its iPad conversion with only a few minor tweaks. The port includes the Stranger's Dream DLC (and, if I can say so, its first-rate narration), and a few alterations to the difficulty and menu systems. Oh, and then there are the weapons: "While the majority of the content in Bastion for iPad is very similar to previous versions, some weapons have been retuned and some upgrades redesigned in order to best fit this platform," say the Calamity survivors at Supergiant. "If you're a fan of previous versions of the game, we hope you'll enjoy discovering some of the differences in feel in some of your favorite weapons." Course, it ain't all sunshine and roses. Because of the game's specs, it's not playable on first-generation iPads or any kind of iPhone/iPod Touch. Don't go expecting a free trial, either, as Supergiant is out to avoid any confusion over "lite" versions of games in the App Store. Guys and gals who already own the game on XBL or Steam will have to buy it again, but I never said life was fair, Kid. Not that I'm gonna tell you how to spend your cash, but the iPad version of Bastion will retail for $4.99 (the Xbox/PC prices will stay the same, though). If you still don't own a platform that can play it, Supergiant hasn't ruled out porting it to other gaming devices, but they've got no immediate plans, either. You want my advice? I say be grateful for what you've got, and give it a go if you haven't already. That's it, Kid. Get to it.